Many women don’t worry much about how their eating effects their baby until they’re “eating for two”. But, what you eat before you’re pregnant has a significant impact on your chances of conception, too. A milestone study known as the Nurses’ Health Study II, showed that along with a few other lifestyle factors, eating a “Fertility Diet” can result in a lowered risk of ovulation disfunction, favorably affecting fertility. 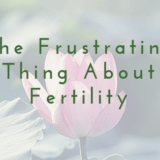 What is this Fertility Diet? Not surprisingly it consists of a lot of what health professionals have been advising us for decades for general health! 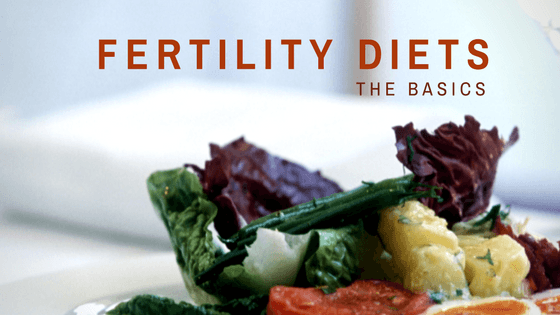 Here are the basics of a Fertility Diet and how you can incorporate them into your life without overcomplicating things. While you can – and should – check the nutrition label on packaged foods, just because it says “0 trans fats” doesn’t necessarily mean you’re in the clear as it could still contain up to a half gram per serving. When in doubt, check the ingredients for “partially hydrogenated oils”. The majority of trans fat foods are desserts, which isn’t to say you can’t have dessert, but there are healthier ways to get your sweet fix. My main suggestion is to bake them yourself. When you bake at home you’re in control of the ingredients and aren’t adding all the preservatives that are packed into grocery store treats to make them last longer on the shelves. Not into baking? Go out to a real restaurant for dessert! Local ice cream shops and bakeries are using real ingredients in their sweets, and while overindulging in sugar isn’t good for your fertility (or health in general) there’s nothing wrong in grabbing an occasional sweet treat. Just be sure those indulgences are the real deal, not a fake mix of chemicals. Love popcorn? Avoid trans fat laden microwave popcorn with a hot air popper. Not only is it a healthier option, it’s MUCH cheaper. 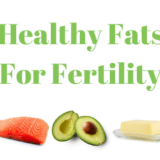 Healthy fats are a huge component of a fertility diet because of their role in female hormone production. 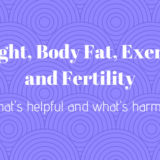 In short, body fat cells produce estrogen which not only supports healthy bone formation and gene expression, but is essential for a healthy menstrual cycle. In a culture obsessed with non and low-fat foods, it may come as a surprise to have the green light for full fat foods like milk and cheeses. I can attest to this. I had very low body fat due to my marathon running and in seeing a reproductive endocrinologist, discovered I wasn’t getting my period because I had zero uterine lining. My body had such low estrogen levels there was nothing for my uterus to shed. No period. No baby. To boost your fertility it’s advised to incorporate whole fat yogurt (so long as you can tolerate dairy), milk, and cheeses, as well as plenty of omega-3 and omega-6 fatty acids. Coconut oil may be a saturated fat, but it contains medium-chain fatty acids which give you quick energy and are easy to digest, versus long-chain fatty acids. Cook with coconut oil over other oils like canola, vegetable, and even olive oil. Consume nuts like almonds, walnuts, peanuts, flax seed either on their own or incorporate into dishes or smoothies. They are a great source of protein as well as healthy fats. Also, add avocado do any and everything! It’s is a great source of healthy fats plus Vitamin C (which helps trigger ovulation), K, and Folate. “Slow carbs” are slowly digestible and rich in fiber that can help regulate blood sugar and insulin levels which help fertility as too much insulin causes issues with ovulation. 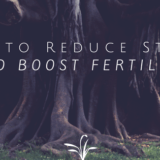 For optimal fertility you’ll want to severely limit or avoid white and processed grains like white rice and bread or semolina pastas. Go for whole grain breads and pastas. Products marked as “wheat” aren’t necessarily whole so look for the term “whole grain” on ingredient lists. Limit grain carbs when you can. No need to go overboard and cut out carbs (unless you have a food sensitivity which can cause inflammation), but the more carbs you get from breads, the less you get from vegetables. Try incorporating carbs like sweet potatoes and beans to get more variety in your diet while still getting the brain boosting power of carbohydrates. Look for Grass Fed meats that are a great source of essential fatty acids and protein. When shopping for poultry (another awesome source of protein) look for the terms “cage free”, “free range”, and “organic” that will give you the healthier form of poultry. I have to mention a study by Dr. Jeffrey Russell that found patients who’s macronutrient ratio was 25% or more from protein and 40% or less from carbs showed pregnancy rates 4 times higher than those with more carbs and less protein. While there still needs to be more research to, it’s apparent that importance should be placed on getting enough quality protein. With that said, the Harvard Nurses’ Study found that the type of protein you get matters as well. They recommend replacing one serving each day of animal protein with vegetable protein. Sneak in vegetable protein wherever you can; salads, casseroles, and soups are super easy to add extra ingredients to without compromising the dish. When eating meat, serve yourself a smaller piece and up the protein with a side of veggies high in protein. Here is a list of veggies high in protein to start adding to dishes now! Research has shown that women taking an iron supplement were 40% more likely to be fertile than those who did not get adequate iron (source). Iron intake is also backed by the Harvard Nurses’ study which places importance on getting iron from plants, not just taking a supplement. Whether you take an iron supplement or meet your iron intake through plants, importance is placed on getting adequate iron. Generally 18 milligrams is the recommended amount for women 18-50, however you may want to check with your doctor to see where your iron levels are now and what they recommend for you specifically. I will always recommend food over supplements, and even if you take an iron supplement it’s good to keep these iron rich foods in mind when grocery shopping and cooking. It’s been shown that sperm can more easily move through hydrated – more fluid – cervical mucus, and hydrated you means a hydrated cervical mucus so drink up, and make it water! Research has shown that one or more sugary beverages a day (think fruit juices and sodas) reduces the chances of pregnancy. Water, water, water! If you don’t naturally opt for water, try adding fresh lime for a kick. I like to use a large tumbler and set the expectation of filling it 3 times a day to ensure I’m getting enough. Go for sparkling water beverages like La Croix over soda, and limit your caffeine and alcohol consumption to 1 drink per day. Generally, a diet optimal for fertility is pretty similar to that of optimal health. When in doubt, ask yourself if what you’re going to eat would be good for making a baby. You’ll know in your gut what’s good and what’s bad, these details will only up your chances! 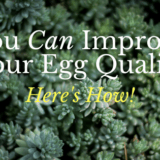 Ready to start your family but need help consistently eating for fertility? I would love to talk with you about where you’re struggling, and come up with an action plan to get you on the right path! Click here to see how you can work with me, and here to start the conversation.